Geranium can be used to lift the spirits and reduce tension. It is commonly used in skincare to boost skin health and clear sluggish looking skin. Geranium essential oil is extracted from the leaves and stalks by the process of steam distillation. Geranium blends well with bergamot, cedarwood, citronella, clary sage, jasmine, lavender, lime, neroli, petitgrain, rosemary and sandalwood. 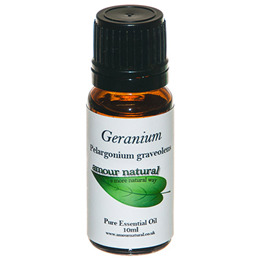 Below are reviews of Amour Natural Geranium Pure Essential Oil - 10ml by bodykind customers. If you have tried this product we'd love to hear what you think so please leave a review. I'm new to this essential oil. It has a strong smell and I enjoyed the recipe this oil went into.